A City of Chicago snowplow driver found a bicyclist dead in the 300 block of West Pershing Road at about 6 p.m. Monday. This location is just south of U.S. Cellular field near the Bridgeport neighborhood of Chicago. This neighborhood has recently seen an influx of bicyclists as younger people move into the neighborhood. The neighborhood has become more popular due to its more reasonable rents and location to Chicago's Loop. The bicyclist was apparently a victim of a hit-and-run bicycle vs. motor vehicle collision. This is obviously a violation of the law in and of itself. 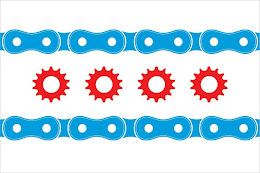 More specifically, driving within 3-feet of a bicyclist or in such a manner as to intimidate or harass a bicyclist is illegal in Illinois due to recent changes in the law. Please see this www.ILBicycleLaw.com blog post on these recently enacted laws. The purpose of these laws was to protect bicyclists and to reduce the number of accidents and collisions resulting in injuries to bicyclists or, as is unfortunately seen in this instance, deaths of bicyclists.